Eyelid surgery, or Blepharoplasty, is a commonly performed procedure to brighten, freshen and rejuvenate eyelids. 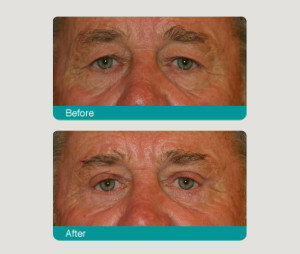 The eyelids are one of the first areas to show the changes associated with ageing. Eyes and eyelids are also the most commonly observed facial features that are noted when conversing. Commonly people say they look tired, angry or old. Skin excess, muscle excess and drooping fat pouches contribute to this appearance. Each of these components is assessed individually and surgery is tailored to address the varying amounts of each, allowing differing amounts of skin and muscle to be resected. The fat may either be excised or repositioned. Stitches then hold and reinforce the structures that retain the fat pouches. Eyelids of Asian appearance often lack the crease in the upper lids. This can be surgically reconstructed to give a fold in the upper eyelids. At times, very loose lower lids may need to be tightened. In cases where only fat needs to be removed from the lower lids, surgery can be performed through an incision on the inner surface of the eyelids which leaves no skin incisions. If your upper lid skin touches the eyelashes or impedes vision, then a Medicare or Health Fund rebate may reduce the cost of surgery. Hooding of the upper eyelids is a skin excess that usually occurs in the outer part of the eyelids. Surgery can be performed under local anaesthetic, twilight sedation or general anaesthetic depending on the complexity and the amount required. It can be performed in the rooms, day surgery or in hospital. Cold packs are often placed over the eyes to reduce swelling and bruising. These are not taped or secured and can easily be removed and replaced so even people who suffer from claustrophobia seldom have problems. Incisions are usually well hidden. The upper incision is made in the skin crease, while the lower incision runs just under the lash line. These may need to be extended into the crows’ feet or smile lines at the out edge of the eyes. Most people do not report much pain, but more a description of discomfort. A gritty, dry feeling is common and may persist for a number of weeks. Bruising and swelling is variable from person to person and even from side to side. It is usually maximum at about three days and usually tracks downwards under the effects of gravity. Elevation when sleeping with the head raised helps the swelling and bruising, as does avoiding lifting, stooping, straining and limiting strenuous activity. Dry eyes are common, as well as redness and itchiness. Eye ointment is useful to treat this and routinely prescribed. Light sensitivity, excess tearing and blurred vision may occur temporarily and sunglasses are very useful. Small cysts may occur along the suture line, especially in the upper lids. The outcomes of surgery may be affected by thyroid disease, high blood pressure, smoking, glaucoma, dry eyes and allergic eye conditions. Pre-operative consultations on at least two occasions are required for assessment. This allows informed expectations and outcomes to be discussed. All these risks and likely outcomes will be discussed at the time of consultation. There is a very low incidence of blindness of approximately 0.04%. This is usually associated with deeper fat pouch resection. Sutures are removed between 3 and 5 days. From about 2 weeks, sedentary-type work can be commenced and most people are able to return to work and a post-operative plan will be detailed after surgery. Surgery may be combined with browlift, nose surgery and face or neck lifts. At the time of your consultation, Dr Kippen will give you brochures to read and show you presentations covering assessment, outcomes and risks of surgery. The presentations are broken up into pre-operative assessment, intra-operative detail and a likely post-operative course and recovery.